Be one of the world’s best wire products manufacturers known for outstanding products, quality and customer satisfaction. Be a leader in our industry in the search for and use of new technologies. Be an adaptive, responsive organization known for integrity, individual respect, empowerment and open communication. 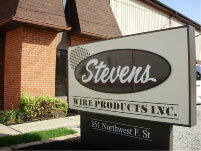 Stevens Wire Products is a family owned manufacturing company founded in 1960 by W. Ray Stevens Jr. Ray’s hard working attitude and strong belief in quality, customer service and competitive pricing are still deeply rooted in our mission statement today. 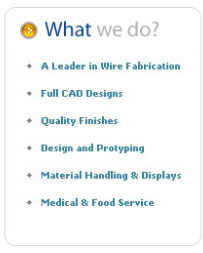 Stevens Wire Products, Inc. is a progressively developing company, both in technology and industrial standing. We have the capability of fabricating in a variety of wire sizes and types including: low carbon steel, stainless steel, pre-galvanized, and spring wire in wire diameters from 1/16” up to 1/2”. 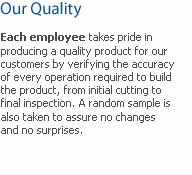 Our commitment to customer satisfaction means a quality product produced at a competitive price and delivered on time.